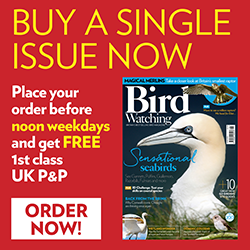 There’s no question that Scotland offers some of Britain’s best birding, but the very wildness that makes it so attractive to nature can also deter some birdwatchers. There are the distances involved, the relative isolation once you get away from the big cities, the unpredictable weather, and of course the dreaded midges in summer. The Cairngorms, the Hebrides and the west coast offer huge birding riches, but exactly how do you get at them? Until well into the 20th Century, the west of Scotland was very much a maritime world, and even now there’s probably no better way to test the waters than by actually taking to the waters. The Majestic Line’s cruises allow you to do so in luxury. Boarding the Glen Tarsan at Hunter’s Quay, on Holy Loch (with Eiders bobbing on the waves everywhere around you), you follow a relaxed itinerary that’s shaped to suit the time of year and the weather. We travelled in mid-April, sailing down the Firth of Clyde, then past Rothesay into the Kyles of Bute, finally dropping anchor for the night in Loch Riddon. We used the last of the light to watch gulls gathering to roost, with the odd Cormorant or Oystercatcher along the shore. The boat effectively acts as a highly efficient mobile hide, being just far enough from the shore not to disturb the birds, but still close enough to see them well. Where it scores heavily over the sort of hide we birdwatchers are used to, however, is in having top quality cuisine to hand! The food was superb throughout the trip, with a focus on local produce including salmon, haddock, scallops and venison, but all tastes can be catered for, and tea, coffee, fruit and snacks are available all day. Wine is included with meals, and a bar means that you can always sample one or two of the single malts if you feel the need to keep out the cold. The next day, we sailed on, crossing Kilbrannan Sound in bright sunshine. It made for perfect conditions for a bit of seawatching, so I got myself comfortable on a lounger, with binoculars and scope to hand, and started scanning. Gannets occasionally flashed past, although their nearest nesting site is at Ailsa Craig, well to the south. There were plenty of gulls, too, the first few Common and Arctic Terns, and occasional Razorbills and Guillemots, plus Fulmars whenever we got close in to the cliffs. The highlights, though, for me, were the Black Guillemots, known locally as ‘dookers’ (I think because of their habit of ducking beneath the waves). They’re smart, attractive little birds, and there are few better places in the UK to see them. Certainly I’ve never seen so many, and showing well. We reached the Isle of Arran, and went ashore at its main town and harbour of Brodick. We’d been warned to keep an eye on the skies for Golden Eagles, but although we had no luck there, there was plenty to keep us occupied. Brodick also has Arran’s main ferry port, so it is possible to reach it quickly from Ardrossan, on the coast of the mainland. Later we moved on to Lamlash, in the next bay, protected by the great bulk of Holy Isle, and with Arran’s own mountains (the moors can contain Hen Harriers in spring and summer) still looming large in the background. After riding at anchor overnight, we went ashore on a glorious spring morning, and I was able to see a familiar fieldguide claim confirmed. Throughout the trip, we’d seen both Hooded and Carrion Crows, but here we twice saw one species paired with the other. No sign of any of the hybrid offspring that are possible, but doubtless they were around later in the year. Evening arrived and we put ashore again in Lochranza, on the island’s north-western tip. It’s a picturesque village huddled around a calm bay, with mountains looming dramatically behind its small castle, built on a spit jutting out into the water. It made a good vantage point to watch the wildlife – Grey Seals lounging on the shores, Red Deer everywhere from the highest mountain to the paddocks bordering the road, and a scattering of waders on the exposed mud. The ubiquitous Oystercatchers were there, of course, but so too were Redshanks, Curlews and Whimbrels, the latter passing through on migration and providing a great opportunity to compare and contrast them with their larger relatives. Out at the mouth of the bay, a Red-throated Diver appeared and disappeared again and again. Walk up the hill out of the village, and you’ll find the Isle of Arran distillery. It’s also the best place to watch for Golden Eagles. In summer, you can also reach Lochranza from Claonaig, on the mainland’s Kintyre peninsula, but part of its appeal is that it feels satisfyingly remote. We enjoyed another glorious meal, more banter over the single malts, and were lulled to sleep by the gentle rocking of the boat as it rode at anchor. It’s worth stressing again that the exact route taken by the boat can change at any time, to suit the weather and seas, but that’s part of this trip’s appeal. You sit back and let the superbly efficient and very friendly crew do the difficult part, and enjoy the wildlife, the scenery, the food and the sensation of stepping outside the rat-race. If it’s hectic rarity-chasing you’re after, then you really need to look elsewhere – but if you’re looking for a genuine holiday, with some fine birding thrown in, then it’s hard to beat.